Having signed up for a few big races this year, including the Eco Trail de Paris, Comrades (the uphill version), and the South Downs Way 100, I decided that it would be sensible to get a little practice in. 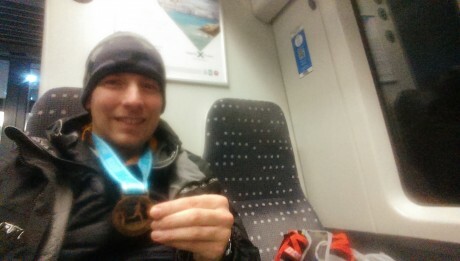 At the start of the year I realised I’d not actually participated in an ultra race in over 6 months, as the last had been 78k of fun in the rainy mountains around Davos! As such, I thought I’d better get signed up to one quick, and what better than finding an event in good old East Anglia. The Peddars Way Ultra fitted in with some other shorter races that I had signed up for, and I was lucky that the waiting list allowed me to obtain a position about a week before the race. Travel logistics for the event are a little tricky if you don’t own a car. However, rather luckily, one of the SVP100 competitors from 2014 sent me a message a few days before the race, offering a lift from Stansted. This would work perfectly, as I could get out from London and back in a day, without rail replacement bus services! So, the alarm went off at 3:59am on Saturday 1st February, the morning of the race. I’d had a terrible night of rest, as I just can’t force myself to get to sleep at 9pm, particularly when there is lots whirring around in my head. I’d stupidly taken something to help me sleep too, which meant that I was particularly groggy when the horrible alarm sounded. As I stepped outside my flat in London, snow was falling. I thought ‘damn, if it was snowing in London, what’s it going to be like in Norfolk’? I was prepared to face Arctic conditions! The train journey to Stansted was interesting. Lots of boozed up individuals on their way home after a night out, and plenty of people off on holiday. The train ran to time, and I managed to meet up with Chris Howard at Stansted. We had a great chat whilst driving up to Norfolk. I was slowly starting to feel a bit more with it, but certainly could not entertain the thought of running. With the help of my mobile phone, we navigated to the starting location which was in a car park in the middle of nowhere. It was still dark, and the area looked more like a local dogging spot than the start of a race. However, we knew we were in the right location when we spotted people dressed in Lycra dashing around, trying their best to keep warm. Kevin Marshall provided the pre-race briefing at 7:50am sharp, and before we knew if, the race had started. I had no idea about the experience of the rest of the field, so I was happy to let a group of 5 runners shoot off into the distance, whilst I slowly picked my way through some of the other overly keen starters. I must admit, I thoroughly enjoyed the scenery at the start of the race. 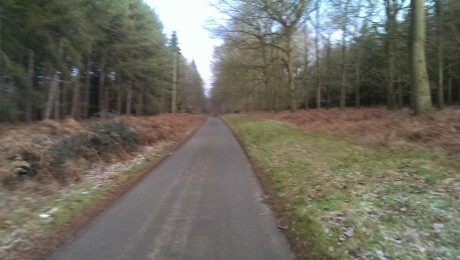 It was lovely running on the edge of the forest, with the sound of woodpeckers and deer dashing across our path. At one point I was trying to scoff down a Cliff bar, when a herd of 20 deer crossed the route ahead, which was quite a majestic sight. Unfortunately my phone camera zoom is pretty poor, so you will have to use your imagination. I kept the group of 5 leaders in my sights until the first aid station at mile 13. However, I calculated that they were running at a 6-7hr finish pace, which I figured might be unsustainable, so I was happy to let them head off into the distance. At the aid station, a rather well stocked set of picnic tables, I was joined by Chris Seymour, who had previously run the SVP100. It was nice to have some good company, and we ran together and had a really good chat. The miles seemed to fly by! At one point, I remember looking at my Garmin and saying “hurrah, we only have a marathon to run now”! We picked off one of the lead group who had clearly started to struggle with the pace, and managed to make pretty good progress. I must admit, Chris was looking much fresher than me, so after around 26 miles I was happy to let him push on ahead. We had run a 3hrs 46 marathon, which I figured was a pretty decent pace for a hilly ultra. Did I mention there are hills? Yes, Norfolk is far from flat! In fact, there was over 600m of climb in the whole race, so definitely undulating! After the second aid station at approximately mile 27, located in a beautiful village called Castle Acre, the weather really seemed to turn. 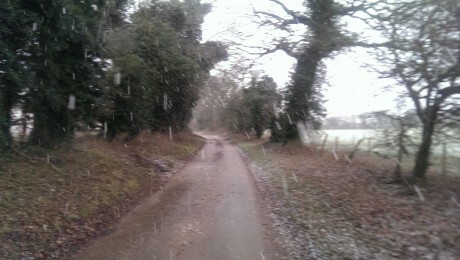 It has been pretty chilly throughout the morning, but as I left the village, flakes of snow started falling. I thought ‘winter is coming’!!! The snow started to get harder and harder, so my hood went up and my head went down. It was time to dig deep and push on, regardless of the conditions. The snow came down harder and harder, the wind picked up, and the trails became wetter and muddier. This was not going to be an easy run, and I started thinking about a programme I’d watched on the Friday night whilst packing my race kit. It was about a chap who was aiming to become the fastest person to ski to the South Pole from the coast of Antarctica. During his adventure, he had started to get signs of frostbite in his nether regions. I started to get concerned as I was only wearing leggings, the temperature had really dropped, it was incredibly windy, and I was soaked through…I just hoped that the old boy was staying safe. I don’t remember too much about the last 15 miles. I was mostly looking at the muddy trail as the snow was blowing into my face, and some of the tracks were very slippery and difficult to run along. I do remember passing another runner who had decided it was easier to walk into the strong headwind rather than run, and another guy who overtook me complaining about the loss of feeling in his hands. The snow eventually subsided, but it was replaced by cold rain, which was probably worse. I had really struggled to get my thin running gloves on, as they were soaked through and my hands were numb. I really did not want to expose my fingers to the wind, as I remember getting temporary nerve damage at the end of the Thames Path 100 a few years back. As such, I was only checking the route on my Garmin every 10 minutes or so. Eventually I thought it was a little odd that I could not see footprints in the mud, and after checking my watch, I realised that I’d missed a discreetly hidden turning. I’d only run 0.2 bonus miles, so things could have been much worse! Eventually I spotted the sea, which was rough and the whole coastline looked very bleak. However, it was a welcome sight and brought a smile to my face, as I knew the end was nearly in sight. My pace increased as I ran down the muddy path that lead towards the sea front, and in the distance I saw a book attached to the final sign on the Peddars Way. We had to detach a page from the book and bring it with us to the finishing location. There was a chap desperately struggling with the book in the high winds and rain, and after he had finished, I tore my page and started to run with him towards the finish. As we ran away from the sign, he staggered into me. At first I thought this was due to the winds, but in retrospect he seemed very fatigued and possibly slightly incoherent. 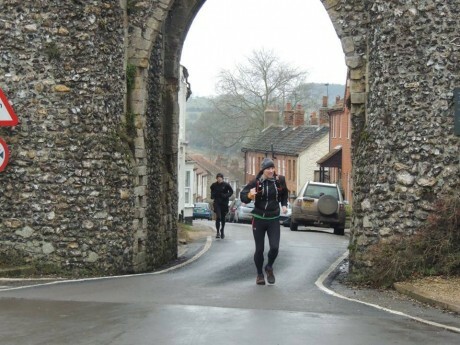 We ran together towards the village hall where the finish was, which is where we made a small mistake. Rather than running to the front entrance of the hall, we ran towards a gap in the bushes, which took us to the wrong side of a handrail leading to the front door. The other runner tried to dip under the handrail but simply collapsed onto the floor. He then started crawling to the finish line, in a scene reminiscent of when Sian Welch and Wendy Ingraham completed their Ironman race on hands and knees. After helping him to his feet the race was over! There was shelter from the winds and rain in the village hall, and I was surprised to learn that I’d finished in 4th place overall, only 18 minutes behind the overall winner. I’ll never be as fast as those skinny little whippets who win cross country races, but I seem to be able to hold my own over longer distances in tough conditions. I’m definitely built for strength and endurance rather than speed. I was very pleased to find out that Chris Seymour had finished in second overall. Given that I was soaked through to the skin and shaking, I needed to get into some dry gear, and get some warm food inside. Fortunately my emergency long sleeved Marino wool top was still dry in the dry-bag, and I also received a finishers t-shirt. Donning these items I went into the village hall kitchen in search of hot chocolate and food. The volunteers were incredible throughout the event and the service was no different at the finish. A very kind lady also found me a blanket, which I wrapped around myself whilst waiting for Chris Howard and her friend David Thompson to finish. After I’d eaten, I was really pleased to see my friend Rebecca Bryant arrive as second lady, and Chris came in shortly after. After she had received her third place prize, we hopped into David’s car, put the heaters on full and headed back towards London. 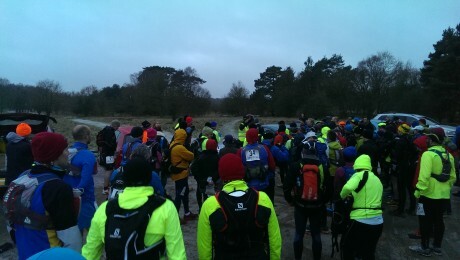 In summary, it was a great event despite the brutal conditions! Kevin Marshall is a keen trail runner himself, so he knows how to put on a good race. There were minimal race markings along the route, but navigation was pretty easy, as can be seen from my earlier Garmin map. I only took one wrong turning, which is pretty good going over 48 miles. 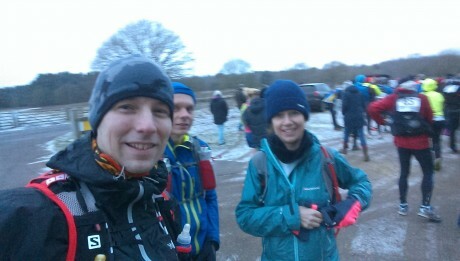 The aid stations were well stocked, and a special mention goes to the volunteers at the final aid station, who went above and beyond the call of duty in the blizzard conditions. I definitely learned some lessons from the race. If there is the possibility of snow, definitely consider carrying waterproof trousers! My leggings ended up getting soaked through and chaffed pretty badly. Fortunately adrenaline numbed the pain at the time, but I certainly could not have carried on for another 50 miles! Also, I think I’ll carry slightly better gloves in the future, as my hands were freezing. Perhaps snowboarding gloves would have been ideal. Other than that, I’m pretty sure the cold weather had simply made me run faster, as I was trying my best to generate body heat. I was also conscious to maintain a good calorie intake so that my body had plenty to burn. I was glad to hear that everyone made it round safely. Despite the extremely tough conditions, everyone had a smile on their face at the finish, so clearly people had enjoyed the challenge. Well done to my fellow runners and everyone else involved with making the race such a success!